Definition of Obesity - Are you overweight or obese? What is the definition of obesity? How do you know when you have crossed over the line from being overweight to being obese? It is generally accepted that a woman is obese when her body weight is 20% above what is considered the normal range for her height. For men, it is 25% above normal range. Just as with the BMI (body mass index) you do need to consider your body type. 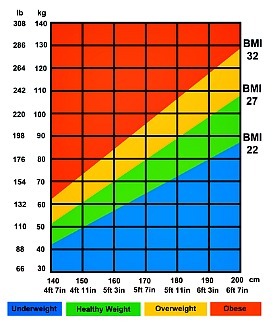 To be a little more precise check out this BMI chart. If your BMI is 30 or above you are obese. Again BMI doesn't consider body type and structure (large bones, thin bones) or even gender. It's a good base line but there's more to the picture. A definition of obesity needs to include not only the body mass index, but your own observations and experiences and whether you are experiencing serious health concerns. Is your weight seriously affecting your life in adverse ways? Is it because of your weight that you are sedentary? Is your weight limiting your ability to function normally? If you answered yes to any of these questions AND if your BMI is over 30, you need to see a physician and be thoroughly evaluated for other health problems. When you fit this definition of obesity you are at risk for many serious diseases including heart disease, stroke, type 2 diabetes, osteoarthritis and even cancer. You have lots of company! Since an amazing 2/3 or 66% of American adults are overweight these days according to the Centers for Disease Control and 33% according to the standard definition of obesity are obese, we know that Americans are getting fatter and fatter. Obviously, these problems are leading us down the road to disease and extreme health costs. The definition of obesity is that the excess fat people carry IS a disease. Fat is actually toxic to the body. Since obesity kills 300,000 people every year it can be life saving to make big changes in the way you are living. What else should you look for to determine if you fit the definition of obesity? If you think you have serious medical problems or difficulty functioning because of excess fat you are most likely obese. But there are other more subtle indicators. What are some of the symptoms of obesity? The following are characteristics that are often associated with obesity that could be indicators that you are not just overweight but headed for disease. If you have any of these symptoms in addition to carrying extra weight it's time to see a doctor and be thoroughly evaluated. Then you need to take serious action before you cannot leave your house because of excess fat! This is the time to take control of your health and your weight. You need to learn what YOU can do if you are overweight especially if your weight reaches the level of the definition of obesity. DIETS DON'T WORK! This has been proven over and over again. Depriving yourself of food you love generally just creates frustration and sets you up for food cravings. You can reverse this road you're on. Knowledge is power and much of what you need to know about getting control of your weight and leading a thinner life is on this website. Go to my 10 Success Steps to get started with the Lifetime Fat Loss permanent weight loss plan. There is no other way to do this except making permanent lifestyle changes. If you've been fat for many years, have obesity in your family and you think you may have insulin resistance, you can fill our my weight loss survey and get a one hour weight loss management consultation. Instead of getting anxious when you read this definition of obesity decide to invest in your health! This weight loss consultation includes 3 months of weekly coaching to make sure that you really change your habits. You will get a written, individualized Lifetime Fat Loss Low Glycemic Plan. This is an aggressive, comprehensive intervention and only for those who are ready to commit to serious change. It's time to take control of your health and your weight! If you are on your way to fitting the definition this is the best time to take control of your life and reverse the downward spiral. Is this your personal challenge or the challenge of someone you know? How did you get to this place and now how can you begin to personally find your way back to health? This website is dedicated to helping you get control of your weight and have permanent fat loss! Keep reading below for more tools and strategies to have a lifetime of fat loss! This is a safe, natural fat blocker that really works to burn fat effectively. It stops the creation and growth of fat cells, burns belly fat and helps to control your appetite and lower your blood sugar! Flaxseed oil provides you with essential nutrients to help you lose the fat. This is the best green tea extract to burn fat and reduce your appetite! What causes obesity and how does it impact you? Childhood obesity facts reveal THE single most significant cause - an additive which is in a lot of kids' foods but one you can avoid. Some simple strategies to prevent childhood obesity for parents and schools. You can reverse type 2 diabetes when you know what to do! What are the top fat loss programs and do they help you lose weight permanently? Are any diet pills? Do they really work? Return from Definition of Obesity to Lifetime Fat Loss home page.